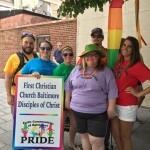 Members of First Christian Church Baltimore, an Open & Affirming Congregation, show their Pride! The Building an Inclusive Church Toolkit provides a guide for your congregation to create a journey towards O&A that meets the unique needs of your congregation. It is not a “cookie cutter” O&A process, but rather a guide for finding the right place for your congregation to start, designing a community building process that meets your congregations needs, and a grace-filled path to becoming an Open & Affirming congregation. And the best way to get started with the Building an Inclusive Church Toolkit is to attend a Building an Inclusive Church Toolkit Training! March 9 – Uniontown, OH – see our calendar – download the flyer. March 30 – Des Moines, IA – see our calendar – download the flyer. In addition, our friends at ReconcilingWorks: Lutherans for Full Participation are offering Building an Inclusive Church Toolkit Trainings in West Linn, OR, Erie, PA, and Salon Springs, WI. These trainings follow a Friday night and all day Saturday format. March 15-16 – West Linn, OR – see our calendar – download the flyer. April 26-27 – Erie, PA – see our calendar – download the flyer. May 3-4 – Salon Springs, WI – see our calendar – download the flyer. Do plan to come, and share the flyers with your friends and leadership in your congregation to encourage them to attend also! You can download the Building an Inclusive Church Toolkit here.